Hits the deck and rolls around. 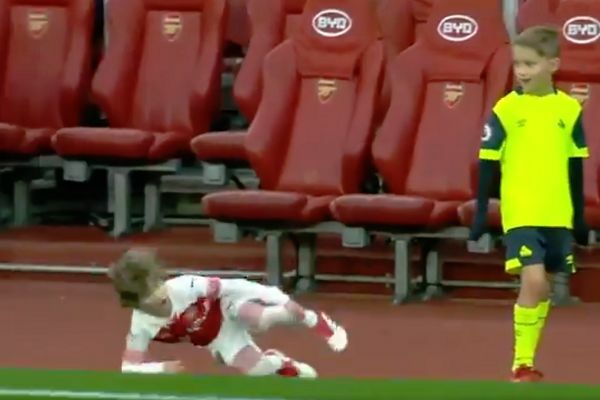 Arsenal’s mascot feigned injury after jumping on his Huddersfield counterpart’s back when the two sides met at the Emirates last Saturday. The young boy leaps up behind the child representing the Terriers, eliciting a mild wave of the arm which he takes as his prompt to go down. He makes an anguished facial expression before hitting the deck and rolling around in Neymar-esque fashion. In the match itself, Huddersfield almost managed to hold on for a creditable draw before losing 1-0 to Lucas Torreira’s late volley. It was the Uruguayan midfielder’s second goal in three games, having previously scored in the 4-2 North London derby win against Tottenham Hotspur. The victory extended Gunners’ unbeaten run to 22 games in all competitions since losing their opening two Premier League fixtures under new manager Unai Emery.